The family room is my favorite room in the house. Probably because I always had the clearest vision about this room when we bought the house and now I feel that it is finally complete and ready for its closeup! Here it is before we moved in, waiting for the furniture. Top on my list for this room was to wallpaper it in this wonderful, warm grasscloth. I knew it would be the jumping off point for everything else, like the zinc shelves over the wet bar and the articulated sconces over the shelves. The original house had upper cabinets over the wet bar but I felt the open shelves were a more contemporary look, even though they pose a decorating challenge! This last week, my vision all came together when the long awaited sofa was delivered--a leather sectional from Pottery Barn. I struggled with the furniture placement for this room originally because it is long and narrow. The sectional corrals the seating arrangement around the tv and fireplace. The wet bar is down at the end doing its own thing, ready for entertaining with the barbeque just outside the door. Another challenge has been what to put on the wall behind the sofa. That weird heating vent really threw me off! Originally, I was going to put a big map of San Francisco but it ended up being too tall, so I gathered all my cow paintings and created a gallery wall. Remember that other Black Forest mount? It ended up here. At the other end of the room, I put an old book case with the Black Forest prints flanking either side. Those prints were originally in our dining room at the old house. I had them in our entry way here, but they somehow ended up in the family room. I think hanging artwork has been the biggest challenge since moving in. I hate making a commitment and putting holes in the pristine walls. Not the case in this room. The grasscloth hides all the holes so if I decide to take this gallery wall down later, it won't be a problem. The family room is aesthetically different than the rest of the house. It's so masculine, yet cozy and romantic too. Which is why I love curling up on the sofa and watching a movie by the fire. 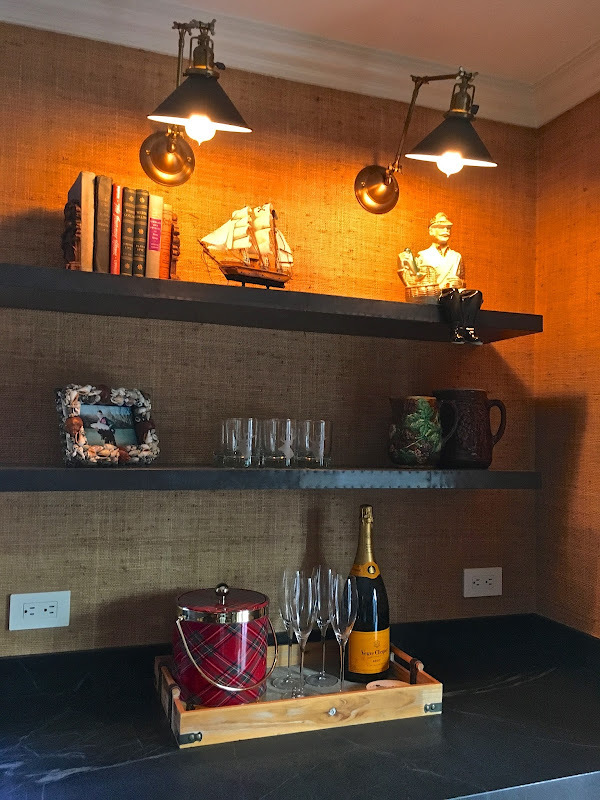 There are still a few things left to do--like style the wet bar and find better pillows, but it's definitely my favorite room in the house! Warm, cozy and inviting, love the grass cloth!D, you will have to check out my blog and see our reclaimed brick patio. The brick came from Stanford University, I think you will like it! Very handsome. I love it! Delores, I've always like grass cloth. If we repaper our entry hall and stair well, it will be in grasscloth this time around. ;-) Love the cozy feel of this space. I know you are a happy girl to be at the point of styling the rooms. Have fun! This is a lovely, welcoming room...I love the grasscloth! Wow this looks amazing- that grass cloth is the perfect texture. I like the shelves vs. the cabinet idea. The sofa is gorgeous and I like how it sets the room up providing plenty of seating if you have a group of people. Love that coffee table- what an awesome piece. Your gallery wall is perfect with it's collected theme and the antlers. I see the animal Hyde made it down there! This is such a great example of how to work with a long narrow room. LOVE this look! The cow paintings, grass cloth leather...perfection! Loving the look of this room. Many great touches. I can see just hunkering down for a marathon netflix afternoon with those cozy blankets and the bar right there. Such a wonderful room. Love your new home. I LOVE the grasscloth, we had it in our old house and I never tired of it. The family room looks beautiful, warm and cozy for sure! The sofa is beautiful and I love the wet bar! Love the grasscloth also! You have made me feel better about my furniture choices after seeing your leather sectional. I've had leather furniture for years (my cats don't use it for a scratching post like they do on upholstered furniture) and I've have felt a little out of it with all the white couches everywhere in the decorating world for the last several years. I've always found them to look impractical and too feminine for the men in my family. You have been such an inspiration to me and I can tell that isn't going to stop now with your new digs. Love this room! looks great with those that you have on it now. The cow pictures are wonderful, where ever did you find them all, and with the beautiful frames? Decorating at it's finest!!!! A truly beautiful room - inviting, cosy and comfortable ! I love everything about it. I am looking for a recommendation as to where I can purchase custom bamboo blinds at a reasonable price? Can you help!? I don't have a recommendation but would suggest looking at Lowes or even Home Depot for something reasonable. Good luck! Love the warmth and coziness you have going on in here. Just beautiful! The gallery wall is amazing, too! Love that gallery wall Delores! I think the cow paintings fit the space really well and I love how they look on the grass cloth. And by the way, when I looked at the first few pictures I didn't even notice that vent! When I read what you wrote, I had to go scroll back up and see what you were talking about! You did such a great job that I didn't even notice the vent - mission accomplished!